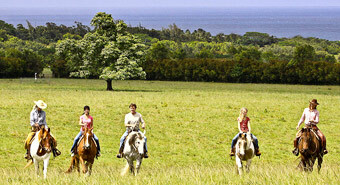 Join us for a beautiful ride on our Princeville Ranch! You’ll enjoy panoramic views of spectacular mountains and valleys with a striking blue ocean in the distance. 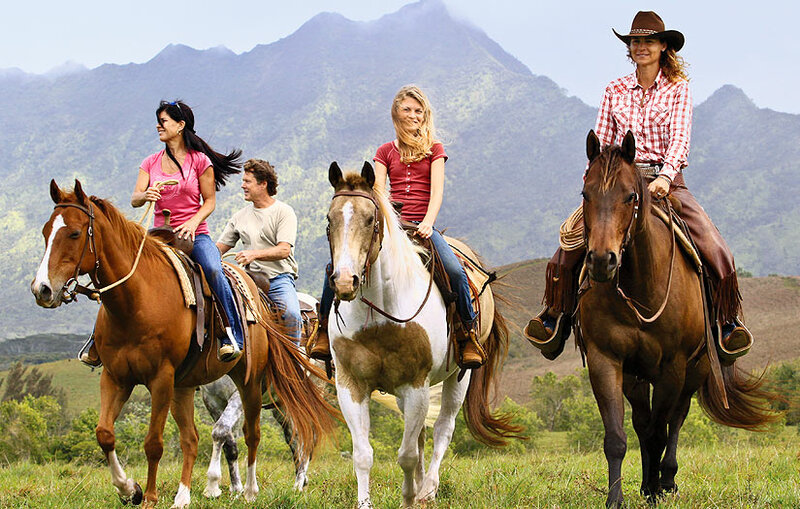 This adventure begins with a brief horsemanship orientation, and then you head out for a leisurely ride across our open pastures. You might even ride through our herd of cows and calves! 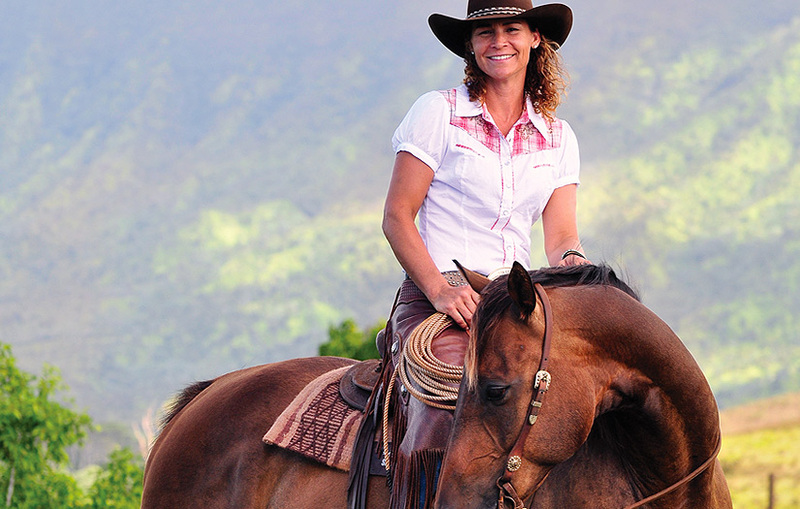 Along the way, our guides will share ranch and paniolo (cowboy) history with the spirit of Aloha. They’ll also stop at special spots with spectacular scenery. Be sure to bring a camera! 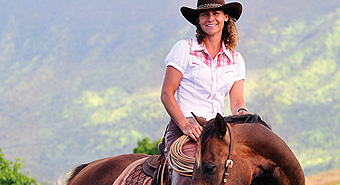 All the experienced guides are CPR & first aid certified and well-versed on Hawaii’s history, fauna and flora. This course is regularly inspected by an accredited vendor of ACCT, has been professionally engineered and constructed to exceed industry standards, and is meticulously maintained. 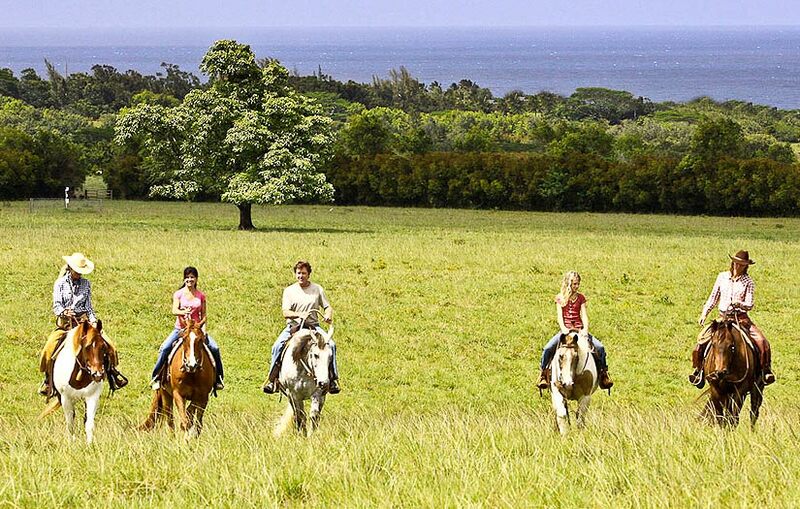 All adventures include use of a back pack and delicious picnics with make-your-own deli sandwich (with a veggie option), chips & cookies except for Zip Express, Ride ‘N’ Glide and two-hour Private Horseback Rides. Rental shoes available (all-terrain @ $5.00 per pair). 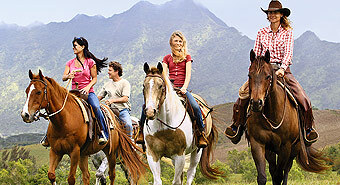 All horseback rides feature Western saddles with helmets available upon request (required for children ages 8-12). One mile from the Princeville Airport on the ocean side of Kuhio Highway (Highway 56) in Princeville. Look for the green & yellow flags & the Princeville Ranch Adventures signs. Eight years of age or older and in good physical condition. Good physical condition with NO recent injury or surgery to feet, ankles, knees, hips or back. No expectant mothers. Children age 16 & 17 may tour without an adult. A parent must sign a liability waiver at check-in. Children age 8 to 15 must be accompanied on tour by an adult who is at least 18 years old. Please note that this tours go out rain or shine. For parties of 5 or less, tour reservations cannot be changed or cancelled within 48 hours of check-in time. For parties of 6 or more, tour reservations cannot be changed or cancelled within 72 hours of check-in time. 48-hour notice of cancellation is required. 72-hour notice is required for groups of 6 or more. All no-shows & late cancellations will be assessed the full tour fee regardless of the reason. Cancellations/changes or no-shows that fall outside of these policies will be charged the FULL AMOUNT of the tour.